A confidential court approved settlement was reached last month involving a drug overdose death in a St. Louis Hospital. 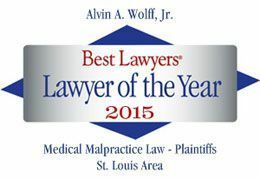 Alvin Wolff represented the widow who lost her husband several days after back surgery. The allegations were that the nursing staff failed to timely monitor the patient. Had she, a reversal drug would have been given and the patient would not have stopped breathing.